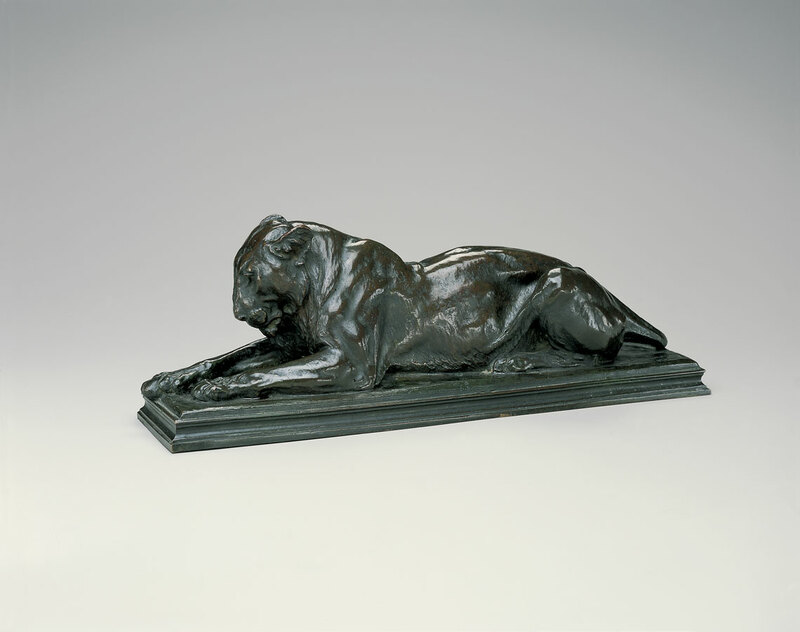 George Booth purchased this resting lioness in 1909 from Tiffany & Company in New York and prominently displayed it in the Sunset Room of his newly completed home north of Detroit, Cranbrook House. Although not the oldest work in his art collection, which became the permanent collection of Cranbrook Art Museum, it was assigned the first accession number: 1909.1. At the time, Eli Harvey was widely recognized as a leading American animal sculptor, known in particular for the moods of his lions—majestic, shy, frolicsome, fierce. Among his most celebrated commissions were the four seated lions he carved in stone for the Lion House at the Bronx Zoo (1901-1903). Initially trained as both a painter and a sculptor in Cincinnati, Harvey devoted himself almost exclusively to animal sculpture following his studies in Paris with the French animalier sculptor Emmanuel Frémiet at the Paris Zoo. In this work, Harvey demonstrates his subtle understanding of feline behavior. With her ears pinned back slightly and tail curled warily, his Recumbent Lioness remains pensive but alert.